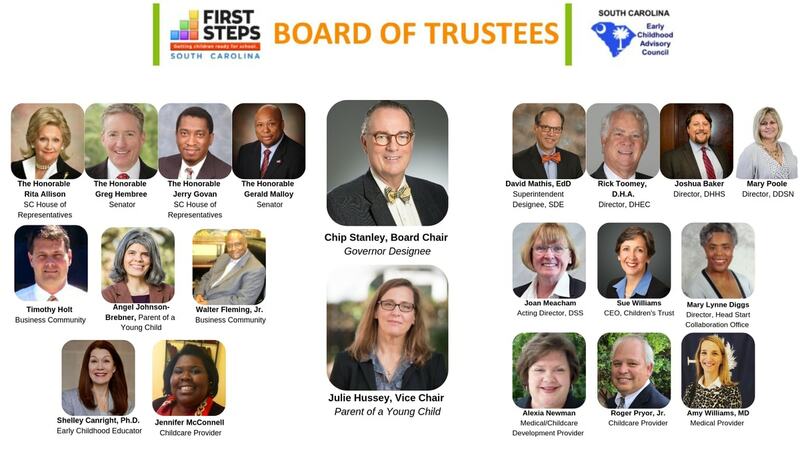 South Carolina First Steps thrives on the dedication, input and guidance of our Board of Trustees. Our Board represents a statewide group of leaders consisting of designated legislators, current and former educators, heads of state agencies, members of the business community and parents of young children. These individuals make up a cohesive board that mirrors the diversity of the families we serve throughout the state. With our board's leadership, we're committed to accomplishing our mission of preparing all kids for success in school, work and life.